LAS VEGAS, Jan. 8, 2018 /PRNewswire/ -- A new era in emotionally stirring electric luxury vehicle design – complemented with global technological breakthroughs in battery technology for charging EVs and personal consumer electronics alike – is arriving at CES 2018 with Fisker's two global launches. LAS VEGAS (January 8, 2018) – A new era in emotionally stirring electric luxury vehicle design – complemented with global technological breakthroughs in battery technology for charging EVs and personal consumer electronics alike – is arriving at CES 2018 with Fisker’s two global launches. Fisker Inc., designer and manufacturer of the world’s most desirable electric vehicles, is unveiling the stunning Fisker EMotion luxury electric sedan for the first time at CES, starting Jan. 9 at Booth #3315. Fisker Inc. – designer and manufacturer of the world's most desirable electric vehicles complemented with some of the longest EV ranges and breakthrough automotive technology – is unveiling the stunning Fisker EMotion luxury electric sedan for the first time in public at CES, starting Jan. 9 at booth #3315. To complement the global debut of the EMotion, the truly groundbreaking, patent-pending Fisker Flexible Solid-State Battery will be on full display – separate from the vehicle. With immense implications for the automotive industry and personal consumer electronics around the globe, the breakthrough battery technology delivers 2.5 times the energy density of lithium-ion batteries – shattering conventional thought on EV range and charge times. DRAMATIC SUPERCAR DESIRE. LEVEL 4 AUTONOMOUS DRIVING. THE LUXURY INTERIOR OF THE FUTURE. ENTER EMOTION. Fisker EMotion disrupts convention in the most sensually radical way. The luxury electric EMotion delivers an exterior design language that emotionally connects with the consumer and evokes senses – complemented with an interior that creates personalized environments through individually designed seats and tailor-made luxury touches. Optional 27" Curved Rear Screen For "Chauffeur Edition"
FISKER FLEXIBLE SOLID-STATE TECHNOLOGY: A NEW ERA IN ENERGY STORAGE AND CHARGING. 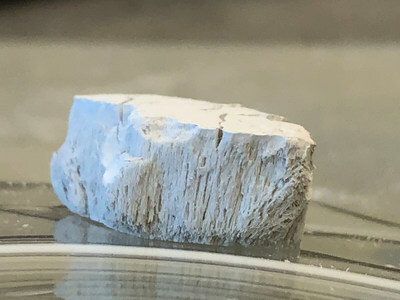 Fisker's scientists, including the former co-founder of global battery tech pioneer Sakti3, filed patents on flexible, superior energy density solid-state batteries. Fisker's solid-state batteries will feature three-dimensional electrodes with 2.5 times the energy density of lithium-ion batteries. Breakthrough technology will enable dramatically longer ranges of more than 500 miles on a single charge and charging times as low as one minute – faster than filling up a gas tank. Automotive applications anticipated to be production grade ready sometime after 2020. Fisker anticipates personal electronics/cell phone battery production earlier – and possibly in 2018. A working battery in a case and an actual bulk battery without a case will be on display at CES. The working battery will be half the size of a cell phone battery, 2mm thick and with superior energy storage. 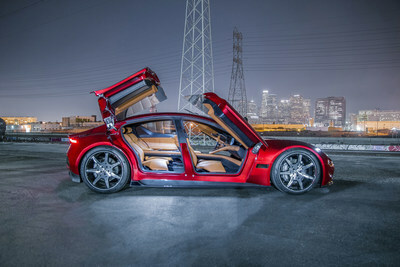 "We are truly entering a new era in the way the world thinks about vehicles, the way EVs are charged and the way personal consumer electronics are powered – with Fisker Inc. now clearly at the forefront of that revolution through our worldwide launches at CES," said Henrik Fisker, chairman and CEO of Fisker Inc. "With the EMotion, we're introducing edgy, dramatic and emotionally-charged design/proportions – complemented with technological innovation that moves us into the future. 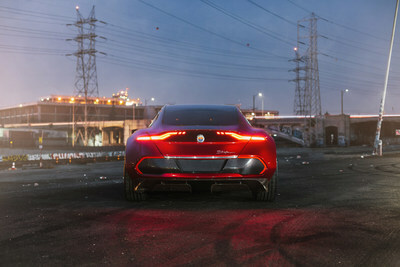 That design balance is what has made the Fisker brand emotionally connect with our consumers. We've also made the seemingly impossible, possible with our scientists spearheading the breakthrough in Flexible Solid-State battery technology – which is the next generation in charging everything from your personal cell phone to enabling mass adoption of electric vehicles due to unprecedented ranges and lighting fast charge times. We're incredibly excited to showcase working solid-state batteries and the vehicle, in-person, on such a massive global stage. Fisker Inc. is about breaking barriers, leading in automotive technologies and ultimately creating the most desirable, functional futuristic electric vehicles." 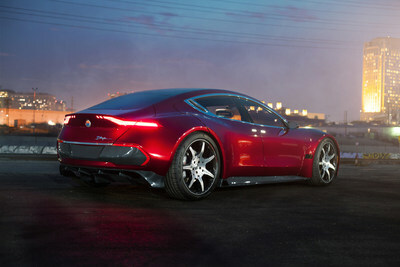 The Fisker EMotion will be produced in the United States at a location to be announced during the second half of 2018.